A widely distributed bug found in well vegetated lakesides, ponds and canals. It is found both acidic and neutral to alkaline water and is predominantly a lowland species, occurring at altitudes under 300m. Gerris odontogaster has two generations per year and overwinters as an adult – often some distance from water in habitats such as grass tussocks. The map is based on records from NBN Gateway, with yellow dots showing pre 1990 records, reds dots 1990 – 2015 records and red on yellow dots overlapping records. 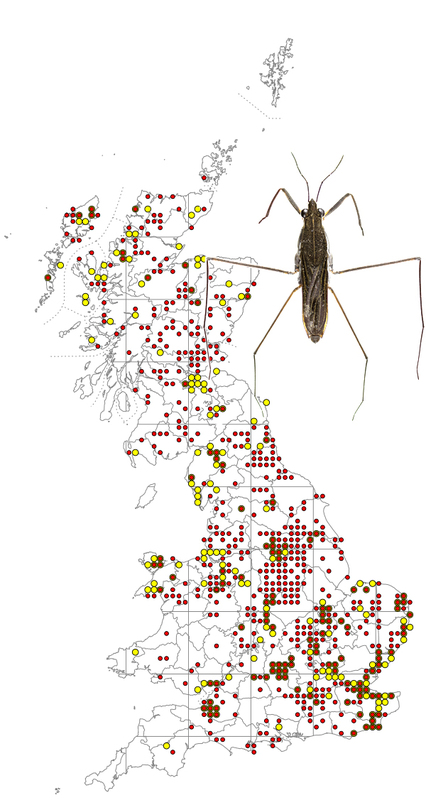 G. odontogaster is widespread in Ireland. Gerris odontogaster is 7.0 – 9.0 mm in length and is most easily distinguished in the male, which has two distinct ‘teeth’ on the underside of the 7th abdominal segment (see below). In both sexes the fore femora are mainly black with only the basal third pale (see below), a character shared by G. gibbifer, which has a distinctive yellow tubercle on the underside of the 3rd thoracic segment and G. argentatus which is smaller and has a band of silver hairs lining the hind margin of the pronotum.